Take a nice walk on Saturday night. A zombie walk. Thanks a lot, zombies. You've displaced "Twilight" and "True Blood" -- and just like that, zombies are the new vampires. And for those D.C. residents going crazy for their next dose of braaaaaaaaaaains -- uh, we mean, zombies! 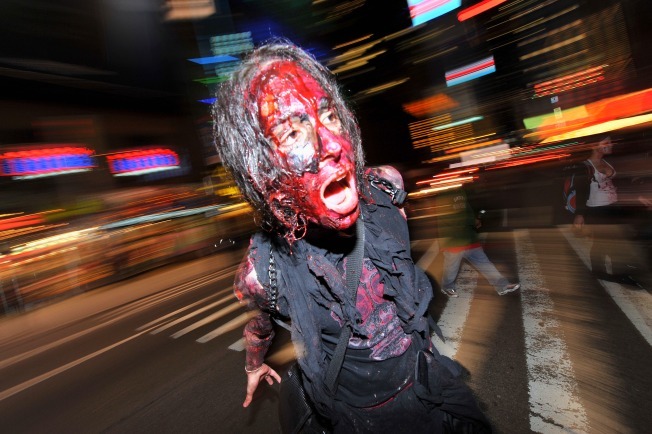 -- the 2009 Silver Spring Zombie Walk is the antidote for those sickening, disturbing needs. Saturday night's Zombie Walk (now in its second year of terrifying innocent, still-brain-having Silver Spring residents) begins at the Quarry House Tavern (8401 Georgia Ave.), where all zombies will convene between 7:30 and 8 p.m. Enjoy burgers and brews before a night of (lethargically) shaking up the town. Zombies who don’t fit into The Quarry House can hang out at nearby Piratz Tavern or Olazzo until it's time to wreak havoc. Participants will "depart" (bwahaha) from their respective bars at 9:10 p.m. to begin their mayhem at the intersection of Bonifant Street and Georgia Avenue, proceeding through Downtown Silver Spring, and ending at the AFI Theatre (8633 Colesville Road) for a showing of "Shaun of the Dead." Just get a bucket of popcorn if you haven't filled up in braaaains yet.